We did it! The first round voting is over and according to the preliminary results, JobMob has qualified for the finals as Best New Blog 2007. You did a terrific job coming out to vote, and this shows that JobMob has a bright future. When so many people in the nascent JobMob Community come together in unison so quickly, it's a good sign of things to come. Thank you and please thank whoever you asked to vote also. Every vote had an impact and was appreciated. This is where you really shined. In fact, we had enough votes to win in two of the other groups too. Thanks again for voting and if for some reason you didn't vote or couldn't vote, you'll get another chance next week when the finals round of voting opens on Wednesday May 9th at 10pm Eastern Daylight Savings Time which is Thursday May 10th at 5 am Israel time. The balloting will continue for exactly one week and the JIB Awards organizers have already announced some improvements for the finals round, notably that people on small networks should now be able to vote. This issue actually caused my wife to go vote in an Internet cafe. 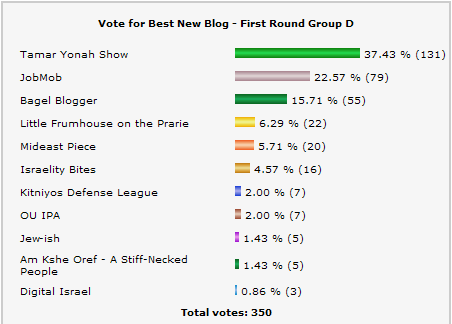 Earlier, I mentioned the lack of Hebrew blogs in competition. There were actually 2 Hebrew blogs nominated in the Non-English Jewish Blog category, amounting to almost nothing among the dozens of other blogs. If anything, there shouldn't even be a category for blogs based on language and I really do hope that next year's edition will have Hebrew blogs more proportionally represented. For this to happen, more efforts will be needed to publicize the awards in the Israeli press and blogosphere. Otherwise, they may as well call them the English Jewish Blog Awards instead and be like the (American) Oscars with a foreign film category. One thing I noticed during the voting is that many people arrived at the voting page on the awards site and misunderstood that voting required clicking on the link to JobMob, which just brought them here. In reality, you needed to click the Submit button beneath the links to continue voting. Did this happen to you? Was there anything else that bothered you with the voting process? Tell us in the comments below, I'm going to pass on these concerns to the awards organizers. Maybe JIB Award should use http://www.dpolls.com/ bassed in Haifa! Could solve some of the technical problems and get their product known. Hi Jacob, just wondering if you are able to see who voted? I don’t think you can see who voted on the JIB Awards site, but alot of people emailed me to say that they voted. Also, many people used the links on the site here to get to the voting pages, so that also gives me a good idea of who else tried to vote. dPolls are nicer looking, that’s for sure, but currently their polls allow you to vote once per day, but I imagine they could make an exception. I’ll suggest it, perhaps dPolls would offer their services for next year so that the Jewish Israeli Blog Awards could run on Israeli technology.